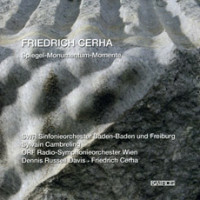 Friedrich CERHA: Spiegel (1960-61)1; Monumentum für Karl Prantl (1998)2; Momente (2005)3. SWR-Sinfonieorchester Baden-Baden und Freiburg1, ORF Radio-Symphonieorchester Wien2,3, Sylvain Cambreling1, Dennis Russell Davies2, Friedrich Cerha3 (conds.). Kairos 0013002KAI (2 CDs) (http://www.kairos-music.com/). Until recently, Cerha’s Spiegel was easier to see than to hear. Its legendary status is reflected in Kairos’ booklet that provides a graffiti wall for many composers to express their admiration for Cerha and his 90-minute cycle. I recall perusing the score in college and being impressed with its visuals. Finally, there is an accessible recording, and we can hear what all the fuss is about. Its close cousins are Xenakis’ Metastaseis (1953-54) and Pithoprakta (1955-56), and Ligeti’s Atmosphères (1961). In Spiegel II onwards, the prevalence of slow-moving textures terrifies and impresses. There are moments when the orchestra obsesses around one pitch, with the strings smearing from low to high and all manner of percussion breaking loose. The work still astounds with its elemental qualities. Spiegel II asks for 55 strings, Spiegel IV has a tape part, and several in the cycle have a harpsichord I didn’t readily hear. From decades later, Monumentum’s seven sections ruminate upon sculptor Prantl’s monolithic stones. Momente offers 11 sections of different character meant to unfold briskly, to reflect the “lightning flash of intuition.” The work was a conscious break with Cerha’s prior ways of working and shows its composer to be adaptable and ever-questioning. Spiegel ought to be perused like a family album. It’s wonderful to have it on disc. 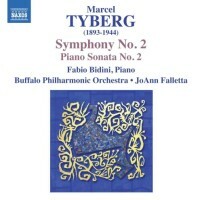 Marcel TYBERG: Symphony No. 2 (1927)1; Piano Sonata No. 2 (1934)2. Fabio Bidini2 (pno), Buffalo Philharmonic Orchestra1, JoAnn Falletta1 (cond.). Naxos 8.572822 (1 CD) (http://www.naxos.com/). Plenty of double-takes and quizzical glances as Tyberg’s Second produces luminous page upon page of Bruckner-lite. I’m not going to get bent out of shape because this music flies in the face of everything I’d expect from something Rafael Kubelik premiered with the Czech Philharmonic in the early 1930s (no one seems to know exactly when). Compared to Furtwängler’s similarly anachronistic symphonies, Tyberg is less dense, more rustic and quickly paced. This in itself should endear Tyberg to fans of the late-Romantic symphony. The fugal finale, giving a sense of what the composer’s organ playing skills might have been like, has flashes of more progressive harmony. The Buffalonians’ fine job suggests a craving for a shot at Bruckner’s Ninth. The 42-minute symphony is followed by the 33-minute Brahmsian Piano Sonata No. 2. Bidini, a confident Romantic interpreter, helps us look past this sonata’s incongruities. As with the symphony, harmonies in the last movement take baby steps into the 20th century. Tyberg’s Third was explored here. Gustav MAHLER: Symphony No. 5 (1902). 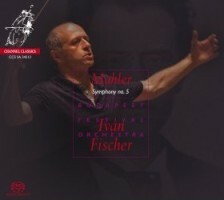 Budapest Festival Orchestra, Iván Fischer (cond.). Channel Classics CCS SA 34213 (1 SACD) (http://www.channelclassics.com/). A wonderful recording teaches something new with pieces we thought we knew well. In Mahler’s Fifth, the second movement often follows as an elaboration or development of the tightly wound first movement. Here Fischer paces the Trauermarsch as if it’s a wholly complete statement. When the Stürmisch bewegt kicks in, it’s an impetuous and angry afterthought, which produces goosebumps when the sunlight arrives at 12:06. Fischer provides an overall arc, from funereal bleakness towards light. Passing moments in the first two movements recall the Third’s naïve melodies and the Fourth’s innocence, demonstrating a capacity for gentleness well before the Adagietto. The large Scherzo can be a meandering slog; these 19:40 minutes are extraordinarily clear. Fischer’s notes suggest this is the most Jewish of all Mahler’s symphonies. I have never thought of it that way. The First could be the primary candidate with its explicit Klezmer interruption, and it intrigues to explore the Fifth in relation to the Resurrection and the Humanist Eighth. The Rondo-Finale is joyous and light, not too fussy with Mahler’s clumsy fuguing – we’ve made it through to sanctuary. 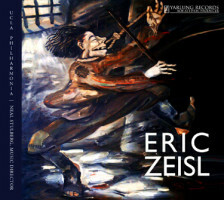 Eric ZEISL: Kleine Sinfonie nach Bildern der Roswitha Bitterlich (1936); November: Six Sketches for Chamber Orchestra (1937-38; ed. 2012); Concerto grosso for cello and orchestra (1955-56)*. Antonio Lysy* (vlc), UCLA Philharmonia, Neal Stulberg (cond.). Yarlung Records 96820 (1 CD) (http://www.yarlungrecords.com/). Each of the Little Symphony’s four movements was inspired by the art of a precocious 14-year-old. The Madman’s brisk 3/4 makes for a jaunty opening. Poor Souls and The Wake are slow movement and scherzo. The Wake is actually about two characters gorging themselves at a post-funeral meal. Expulsion of the Saints is a 14-minute variation set longer than preceding three movements combined. November’s six morose parts suggest happier past events and oncoming winter’s death-like pall. The concerto grosso featuring cello is a late and pensive work, demanding much expression from its soloist which Lysy provides. This is the UCLA Philharmonia’s debut release, presenting premiere performances of the Californian transplant. Rebuilding a career in the US after fleeing the Nazis, Zeisl struggled to regain the footing he had achieved in Vienna. Scoring Abbott and Costello wasn’t a high point. The UCLA players navigate well the Symphony’s light sarcasm as well as the concerto’s sobriety. John Knowles PAINE: Overture to Shakespeare’s As You Like It, Op. 28 (1876); Shakespeare’s Tempest – Symphonic Poem, Op. 31 (1877); Symphony No. 1, Op. 23 (1872-75). 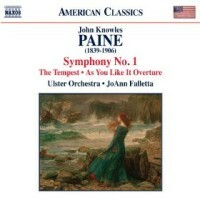 Ulster Orchestra, JoAnn Falletta (cond.). Naxos 8.559747 (1 CD) (http://www.naxos.com/). Paine is the first American symphonist, indeed, the first American musical educator who developed Harvard’s music curriculum which still influences pedagogues today. Schooled in Europe, Paine aligns with the conservative branch of the continental tradition. His music often portrayed Classical subjects consistent with these two Shakespearean illustrations. As You Like It gets directly to the point although it doesn’t suggest the evening brings a comedy. The Tempest portends turmoil. Paine’s somber First is a different beast diligently revealing its aspects. A Mendelssohnian Earnestness is balanced with secondary materials that flirt with a Rossinian lightness of touch. The music could easily be mistaken for Raff. It would take Dvořák’s “New World” symphony (1893) before American composers felt confident to adapt folk or national materials, as in Beach’s “Gaelic” symphony (1896) and Still’s “African-American” (1930). To be fair, Chadwick did demonstrate an interest in folk tunes in his Second (1884-6), yet we must agree that Ives was the first to forge truly American symphonies. Mehta (New World Records NW 374-2) permits Paine more grandiosity with premonitions of Elgar in the last movement. Naxos’ recording seems taken at a distance with subdued strings. For music which so clearly relies upon Mendelssohn and Schumann, the Irish group makes this effort less continental. 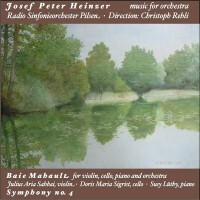 Josef Peter HEINZER: Baie Mahault for Violin, Violoncello, Piano and Orchestra (1991-92)*; Symphony No. 4, “My father’s pictures” (1995-98). Julius Aria Sahbai* (vln), Doris Maria Sigrist* (vlc), Susy Lüthy* (pno), Radio Sinfonieorchester Pilsen (RSOP), Christoph Rehli (cond.). Swiss Pan 51 724 (1 CD) (http://www.swisspan.ch/). A triple concerto for piano trio and orchestra, Baie Mahault takes its name from a region on the island of Guadeloupe, specifically the eponymous marine area. In four varied movements Heinzer expresses his love for the bay’s natural beauty and the underwater landscape’s diversity. Indeed the music glitters and swirls as the tides and weather change, the soloists gently intruding. Heinzer’s style, predominantly tonal, is comfortably ambiguous. Heinzer’s motives modeled on folk tunes somewhat suggesting 19th-century Austro-Germanic composers are scattered across diverse keys as befits the 20th century. As with the triple concerto, the Fourth displays a love for the outdoors. Each of the six movements illustrates one of the composer’s father’s paintings, all reproduced in the booklet. The symphony is stronger than the concerto, in part because the concerto’s soloists don’t always coalesce as a trio. 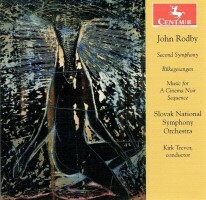 John RODBY: Symphony No. 2 (2005-07); Rilkegesangen (2007-08)*; Music for A Cinema Noir Sequence (2009). Terézia Kružliaková* (m-sop), Slovak National Symphony Orchestra, Kirk Trevor (cond.). Centaur Records CRC 3237 (1 CD) (http://www.centaurrecords.com/). As an experienced music director on the pop music side, Rodby has a seasoned command of orchestration far outpacing many composers. He favors the Schoenberg school’s layered and biting textures, and not simply because the eight Rilke songs suggest Berg. Rodby’s 38-minute Second is a fluent 20th-century exploration. In addition to the second-Viennese-school touches, there are Turangalîla hints, as well as big-band jazz moments and echoes of the mid-century Romantic accompaniment used to back crooners. The different styles surface as continual variations and fit together seamlessly. The notes reveal aleatoric sections within the traditional four movements. I had expected the Music for a Cinema Noir Sequence to imitate Begleitungsmusik zu einer Lichtspielszene; instead it’s in the style of 1950s Hollywood. You can imagine the car taking the curve too fast, or the heroine exhaling cigarette smoke. Richard STRAUSS: Don Juan, Op. 20 (1888); Death and Transfiguration, Op. 24 (1888-89); Till Eulenspiegel’s Merry Pranks, Op. 28 (1895). Pittsburgh Symphony Orchestra, Manfred Honeck (cond.). Reference Recordings FR-707SACD (1 SACD) (http://www.referencerecordings.com/). It really doesn’t get better than this. Should the Pittsburgh complete a series, I might just part with my Kempe discs. Actually, the SACD sound quality makes this a no-brainer. From Don Juan’s opening bars, it is impossible not to smile at this recording’s dynamism. In the notes Honeck itemizes a ticking clock, labored breathing, and irregular accents indicating a distorted gait, etc., all of which are astoundingly vivid. I have long held the outrageous notion that Death and Transfiguration could have stood a bit of editing (it is 26:18 here). There’s either too much dying or transfiguring. I prefer the comic tone poems and am glad that Till Eulenspiegel closes this program. The twisting clarinet precisely portrays Till’s expiration. 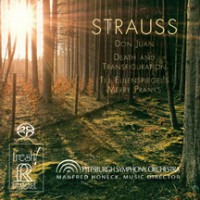 I’ve recommended the Pittsburgh’s Strauss before and will likely continue to do so.